Those who have been to Bali and those who haven’t, everyone heard of Ubud at some point in their life. Ubud is probably the number one tourist town on the island, and develops as rapidly as weeds. I’ve been to this town about ten years ago, when it literally existed of one main street surrounded by rice fields. Coming back this time gave me a bit of a culture shock. What happened here?! The main street was congested with traffic, the streets where filled with tourists and there are way more shops and restaurants. The market streets of Ubud. Don’t worry, even though the city centre might get a bit overwhelming, there are still plenty of reasons to visit Ubud. There’s loads to do in and around Ubud, but it’s most likely you’ll run out of its village centre after one day. The first advice I can give you is to rent a motorbike. There’s literally nothing better than touring Ubud’s surroundings and that’s exactly what we’re gonna talk about here. So hop on and drive along! Scenic routes in abundance around Ubud. You don’t have to go far to enjoy Ubud’s rolling hills and stunning views. The Campuhan Ridge walk is just a 5 minute walk from Ubud’s main street, but gives you the feeling of being in the middle of nowhere. It’s a popular little walk so it can get a bit crowded especially during the day and during sunset. However, during sunrise there might be just a few souls around and that morning light gives everything a gorgeous golden glow. The Campuhan Ridge Walk during sunset. Temples and rice fields, that pretty much captures Ubud. Where those two things come together perfectly is Gunung Kawi. With rock formations dating back to the 11th century and the ruins of an old buddhistic monastery, this is quite a special place. Add to this the amazing backdrop of stunning rice terraces and green hills, and I’m pretty sure you don’t wanna miss out on this place. Can’t believe how lush this place is. The rock formations of Gunung Kawi surrounded by jungle. Celuk is the silver capital of Bali. I don’t know about you guys, but I love to collect jewelry from places all over the world. A lot of jewelry brands bulk up in Celuk, but the silver factories here are also perfect for those on the hunt for a pretty souvenir. If you see something in one of the factories on the main road, make sure to bargain hard. They work with a commission deal with a lot of drivers and tour operators, and the prices are adjusted to this. Bargain at least 30% to 50% off the price to get a proper deal. Get here are as early as possible. That’s my best advice I can give you. Get there at sunrise and you will be treated to the most gorgeous light and a 360 view of rice terraces. Have a stroll around, climb up and down, and soak up the beauty before the masses arrive (map). Don’t let the empty rice terraces pictures fool you… it’s a proper tourist business out here. Tirta Empul is the holy water temple. People from all over the world come to this place to be blessed by its holy waters and live a happy life from there on. It is a bit of a doubtful thing, this water temple. In general, if you wanna see something in Bali and you wanna be the only one to experience the beauty, you gotta get up as early as you can (7am early preferably). However, to properly experience Tirta Empul you might actually wanna visit this place around noon, when the madness is on in all its glory. During prime hours this place is as busy as Ubud’s main street. Which is very, very busy, believe me. Where as the main street of Ubud just drives me crazy and makes me wanna flee asap, here the masses make the beauty. If you’re visiting the Tirta Empul temple make sure you take the route from Ubud via the Tegallalang rice fields. This is the scenic route with a capital S. Beautiful rice fields, jungle cliffs, and sleepy little villages where people play cards on the streets or do their prayers. Just type in on google maps and make sure you are on route to the Tegallalang rice terraces. You are in for a treat! One of the sleepy villages on route to Tirta Empul. There’s definitely no lack of sleeping places in Ubud, but I totally get that the amount of options might be a bit overwhelming. We tested a few and got two absolute favorites in the green hills of Ubud only five minutes from the main street. The first one is Sandat Glamping Tents. Sleeping in a tent has never been this comfortable. With your own private pool, surrounded by rice fields and jungle, this is definitely a gem. Delicious food, yoga lessons and amazing massages (read more about Sandat Glamping here). For all the wellness lovers out there, head to Svarga Loka Resort. This jungly getaway gives you the feeling of being on a movie set. With the most gorgeous infinity pool overlooking the river, bathrooms that overlook the Ubud hills and a restaurant overlooking it all, you get it… priceless views no matter where you are at Svarga Loka. Add to this the Svarga Loka wellness centre with the most relaxing massages, healing sessions and facials, and there surely isn’t a place you’d rather be. For bookings or more information check out their website. No guide would be complete without discussing our favorite restaurants. 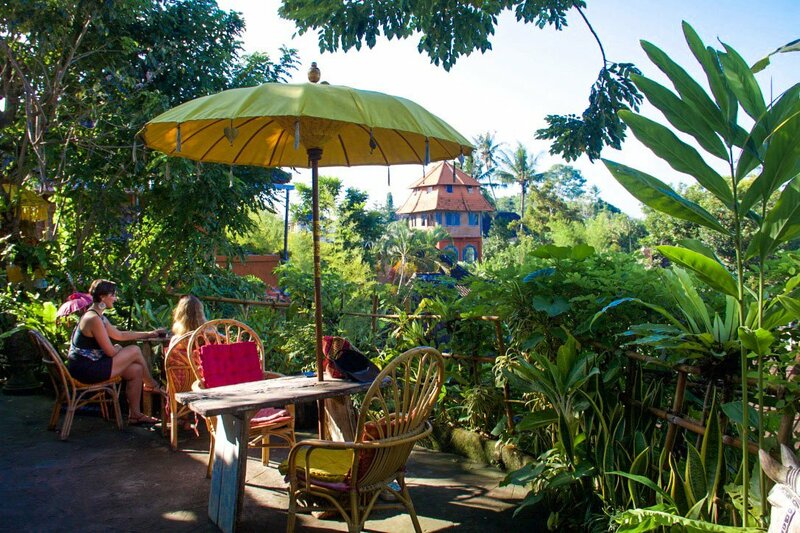 Restaurants are definitely not scarce in Ubud, so there’s something for everyone’s liking. Since we don’t wanna give you an overkill in options and text, hereby a quick sum of delicious places in Ubud. Watercress is a must visit. Anything on their menu is mouthwatering good. Breakfast, lunch, dinner and cakes, it really doesn’t matter for which meal you visit Watercress. My absolute favorite was the Tuna Steak, although their burgers were pretty mean as well. Not the cheapest eatery in Bali, but definitely worth spending a few bucks. For the best view and a lovely organic lunch head to Yellow Flower Cafe. It’s a bit of a mission finding this place (by foot), but when you do you’ll get rewarded big time. For the best bbq duck go to Warung Mendez. Succulent, sticky and covered in a fingerlicking good sauce, this BBQ duck is an absolute winner. Last but definitely not least; Mamma Mia. Italian food in Indonesia. You wouldn’t expect this to be a success. However, we came back to Mamma Mia not once, not twice, but three times. If that isn’t a sign for Italian delight, I’m not sure what is. Spending a few days in and around Ubud is definitely something you don’t wanna miss out on. Fall in love with the beautiful green hills, the great food, the best massages and pretty temples. Make sure to rent a motorbike to get around and explore Ubud’s beautiful surroundings. It’s not without reason this place got so popular. So take our guide along with you and discover Ubud’s gems. P.S. If you don’t feel like diving into Bali’s mad traffic, find yourself a driver. Unfortunately getting an Uber in Ubud is a nightmare. So ask around for a good price or ask your hotel to organise a driver, cause they will rip you off big time in Ubud’s main street. It might be a bit of a hassle, but definitely worth it! Pura Taman Saraswati; a little oasis right at Ubud’s main street. Not one, but two infinity pools at Svarga Loka. There’s a first for everything… like this lesson of White Crane Martial Arts at Svarga Loka. Do spa days get any better with a surrounding like this? Families, friends, strangers and tourists all gather to pray at Tirta Empul. Views along the Campuhan Ridge Walk. Calm before the storm at the Tegallalang rice terraces. Everywhere in Bali, but especially in Ubud, you’ll see kites in the sky. The prettiest are all made in little shops around Ubud. Our private little hide out at Sandat Glamping. Surrounded by the sounds and smells of nature. Is it a bird? Is it a monkey?